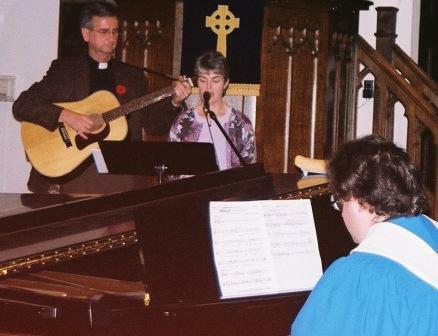 Music is a vibrant part of our worship services and special events. We have a long history of excellent amateur and professional organ, piano, choral and ensemble concerts. Our choir is a core of 10 committed amateur and professional musicians led by Michael McKay, our Director of Worship. Together, they perform anything from Mozart's Requiem to spirituals to contemporary Canadian composers. Practice time is every Thursday evening at 8:00 p.m. The Beckerath Organ is an extremely versatile classic period organ installed in 1963 and renovated in 1993. Consisting of 2 manuals and pedals with 30 stops and 41 sets of pipes, this tracker-action organ is situated in the rear gallery of the church from which position its wonderful tonal qualities may best be obtained. It is the only instrument of its kind in western Canada and is renowned as a recital organ. The 8-foot Baldwin Concert Grand Piano, on the graduated stage by the pulpit, is an excellent instrument for recitals and ensemble work.